Lok Sabha Elections 2019: BJP released its first candidate list for 184 constituencies on Thursday. Smriti Irani was named as the candidate from Amethi in BJP candidates list for Lok Sabha polls 2019. 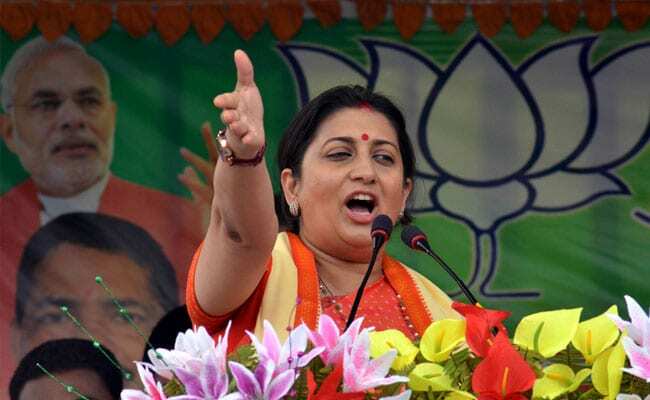 The BJP on Thursday released its first list of candidates for the 2019 Lok Sabha elections, naming Smriti Irani as the party's candidate from Uttar Pradesh's Amethi. A Congress bastion for decades, the listing squarely sets Smriti Irani up for a second fight with party chief Rahul Gandhi. In the 2014 Lok Sabha elections, the district saw an intense battle between Mr Gandhi and Ms Irani. Though Ms Irani lost to the Congress leader, her entry reduced Rahul Gandhi's victory margin from some 3.70 lakh votes in 2009 to 1.07 lakh in 2014. Mr Gandhi, in turn, has blamed the ruling BJP government at the centre and state for taking away the big projects that he had lined up for Amethi. "I thank Prime Minister Narendra Modi, chief Amit Shah and all the senior leaders of the party for giving me the responsibility to contest Lok Sabha elections from Amethi. It would be a matter of pride for me to strengthen the BJP in parliament by offering a lotus from Amethi," she tweeted in Hindi. Voting for the Lok Sabha elections will begin on April 11 and continue for over a month till May 19 across seven phases. Amethi will vote on May 6. The results will be declared on on May 23.